USCG Cutters at NSGB to Prepare for Hurricane Irma Disaster Relief By Mass Communication Specialist 1st Class John Philip Wagner, Jr., NSGB Public Affairs As a 21-gun salute sounded in the distance, patriotism was on full display at the Naval Station Guantanamo United States Coast Guard (USCG) cutters began to make their way into port. Between September 11-13, NSGB would resupply and refuel 25 USCG ships, including eight 87-foot cutters, 13 fast response cutters, one 210-foot cutter, and three 270-foot cutters, so that they could continue on their mission to provide Hurricane Irma disaster relief. Most of the ships had been evacuated from their homeports of Miami and Key West, Florida, due to Hurricane Irma and were making their way back to assist with relief efforts and to check on their own homes. NSGB chaplains, port operations, supply, and security departments dedicated many hours to ensuring all logistical requirements of the ships were met and that all movements were conducted safely. NSGB has not supported this many ships in port simultaneously in recent history, so coordination was of utmost importance to ensuring the port visit was executed without issue. The scheduling portion wasnt bad since they all came in at the same time, said Boatswains Mate 1st Class (BM1) Arren Halfacre, port operations dock services required for the vessels; each one needed different services. During their stay, the ships coordinated with the base supply department for their replenishment needs. NAVSUP supplied 309,688 gallons of F-76 and JP-5 fuel, more than 7,000 pounds of fresh fruits and vegetables, and 13, 650 pounds of dry, frozen and chill food items during the ships visits, said CDR Shane C. Dietrich, NAVSUP Site Director. The USCG Aviation Detachment (AVDET) plays an important role in visits like this by coordinating all contact with NSGB for any and all services that the ships need. We [AVDET] not only helped with logistical support, said Chief Store Keeper David Knapp, AVDET supervisor. We were also there to listen and understand what they [Coast Guardsmen and women] were going through. Its never easy to leave your home during a storm and tell your family to evacuate. During the ships visits, port operations had the 25 ships at six different piers, with 23 of the ships in port at the same time. With each ship needing fuel, we fueled at pier alpha and then shifted each ship to a more permanent location, said Halfacre. NSGB went out of its way to help and ensure the cutters got everything they needed. Every time I come into contact with anyone on this base about a Coast Guard concern or for assistance, I am met with an almost immediate yes, said Knapp. Everyone wants to help and everyone is so positive to assist the Coast Guard accomplish its mission. Knapp added that he wanted to thank all the different departments and divisions on the base for their assistance during the cutters visits, but he wanted to give a special thanks to BM1 Halfacre and Quartermaster 2nd Class Anna Garce for their hard work and the long hours that they put in. NSGB Welcomes Five New Chiefs into the Mess photos by MC1 John Philip Wagner, Jr. and Sargeant First Class Jerry Saslav (CPO) pinning ceremony in the Windjammer Ballroom, September 16. HMC Katherine Kahele, HMC Steven Moore, MAC Brian Speight, ITC Christopher Strysick, and MAC Daniel Wiggs pinned their anchors on and donned the combination cover seven-week induction process known as CPO365 Phase 2, which culminated with an 18-hour Final Night event. 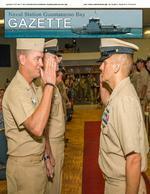 Making Chief was the greatest day of my naval career leadership capabilities, said Kahele. I have been junior Sailors that have always motivated me to be the best version of myself. During the ceremony, the new chiefs were reminded of the enormous responsibility that now fell directly on their shoulders, as well as the reason for the process through which theyd just passed. During the course of this day, you have been caused to humbly accept challenge and face adversity, said Chief Builder Gerry Macias, while all past and present chiefs in attendance stood proudly at attention for the reading of the CPO Creed. This you have accomplished with rare good grace. Pointless as some of these challenges may have seemed, there were valid, time-honored reasons behind each pointed barb. It was necessary to meet these hurdles The goal was to instill in you that trust is inherent with the donning of the uniform of a chief. During my season, I was faced with many challenges that demanded both physical and mental endurance, said Kahele. The support from my brothers and sisters within the mess allowed me to persevere by building upon selfChief. The reading of the CPO Creed was one of many timehonored traditions on full display in the Windjammer Ballroom on Saturday. Each moment of the ceremony, from the presentations to family members, the reading of The Anchors and the reading of The Donning of the Cover, to the piping of the newly pinned and covered chiefs into By experience, by performance, and by testing, you Macias. In the United States Navy and only in the United States Navy the rank of E7 carries with it unique responsibilities and privileges you are now bound to now changed. More will be expected of you; more will be demanded of you. Not because you are an E7, but because After the completion of the reading of the CPO Creed, more than 50 Navy Chiefs were led by the newest chiefs in singing Anchors Aweigh, which as always in the chief realm, concluded with a very loud and proud, Navy Chief, Navy Pride! JTF Troopers Participate in Basic Leadership Course By By Sgt. Clinton Glenn, Joint Task Force Guantanamo Public Affairs Forty-eight Joint Task Force Guantanamo Course on Sept. 14 at Buckley Hall auditorium here. The course is designed to prepare future responsibilities by providing the necessary tools and training over the course of twenty days. test, drill and ceremony, land navigation and the writing of an operation order. The cadre did a good job of creating situations for us to develop, said one JTF Trooper. I feel like this course put me where I need to be in order to go home and become a leader, The 10th Mountain Division Noncommissioned comprised of NCOs assembled from across the Army that travel to various theaters of operation to When asked about the biggest take-away from being an instructor, Chief of Training Sgt. 1st Class Gary Moore said, Instructors learn something new every day from their students. Everyone comes from diverse backgrounds and different situations. What made this class unique is that it was under the threat of Hurricane Irma, the strongest recorded hurricane in the Atlantic Ocean. Despite setbacks due to the inclement weather, the instructors and Troopers were able to adapt and train to standard, graduating all 48 Troopers at the end of the course. Moore said. Naval Station Guantanamo Bay Community Remembers 9/11 By Sgt. Clinton Glenn, Joint Task Force Guantanamo Public Affairs It was a calm and quiet morning on Naval Station Guantanamo Bay (NSGB), Cuba. The sound of the national colors softly rustling in the wind can be heard beneath the daily playing of the national anthem across the base. pews at the base chapel for the memorial service to remember the events from 16 years ago. The service began with the singing of the national anthem and the posting of the colors by the color guard. Soldiers, Sailors, Airmen, Marines, NSGB Firemen and residents all joined together in solitude to honor the lives of those lost on Sept. 11, 2001. We still mourn and remember the innocent victims and Pennsylvania, said Rear Adm. Edward Cashman, Commander, Joint Task Force Guantanamo. Almost three-thousand families would be forever altered on that sunny and seemingly normal Tuesday morning. It was a transformative day, stated Cashman. Everyone remembered where they were and what they were doing that morning. First responders woke up and put on their uniforms for the day, not knowing that, for many of them, it would be the last time that they saw their loved ones. In the wake of true tragedy, true heroes ran toward the signs of danger. September 11th was the day the people of the United States fully understood that the world had changed, Cashman said in closing. The memorial service also featured a JTF Trooper who united through tragedy, that came together to assist in This was the most humbling task I have ever done, said the JTF Trooper. from across the country had come together during history. The memorial service continued with the ringing of City. The third ring stood for the plane that crashed a memorial to the heroic actions of the passengers tower. Concluding the ceremony was the traditional 21gun salute followed by the playing of Taps and the spoke at the service and volunteered in the wake of the attacks 16 years ago. The room was absolutely silent. Those in attendance thoughtfully remembered the lives lost and how the world has forever changed. Today is Patriot Day, stated the JTF Trooper. It is not a day of celebration, but a day of remembrance.